Situated near the junction of the East Pine and Murray Rivers in the foothills of the Rocky Mountains, East Pine Provincial Park provides visitors with fishing, canoeing and boating opportunities on both rivers. Located 30 km east of Chetwynd on Highway 97. Conservation: Balsam poplar is the dominant forest cover along with white spruce. Wildlife: Large mammals such as moose, white tail deer, mule deer and black bear are common throughout the area. Squirrels, chipmunks, beaver, muskrat and river otters are much more likely to be seen along with numerous waterfowl and shorebirds. Due to a swift current and sweepers along the river banks, canoers and kayakers must exercise caution. 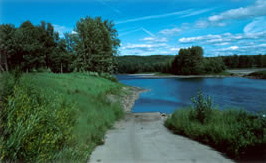 A boat launch provides boating access to the East Pine and Murray Rivers. While campfires are allowed, we encourage visitors to conserve wood and protect the environment by minimizing the use of fire and using campstoves instead. Firewood is not available in the park, so you must bring your own. Limited burning hours or campfire bans may be implemented. To preserve vegetation and ground cover, please don’t gather firewood from the area around your campsite or elsewhere in the park (this is a ticketable offence under the Park Act). Dead wood is an important habitat element for many plants and animals and it adds organic matter to the soil.